I’ve been reorganizing our shared office/studio for the past few months. Things are coming along — we installed a pegboard using this post and hung a wall o’ artwork — but my new-to-me (salvaged from behind our building!) 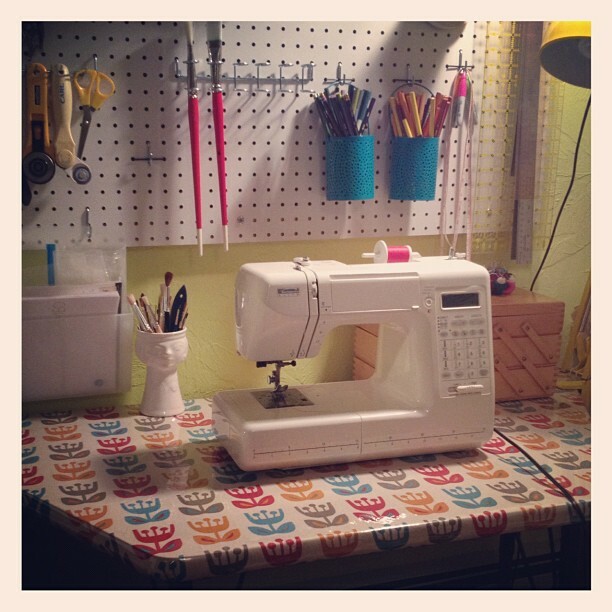 sewing table still needed a makeover…big time. I had an amazing piece of fabric (designed by the author of one of my favorite blogs) I’d stashed away just waiting for the PERFECT project. Yay! 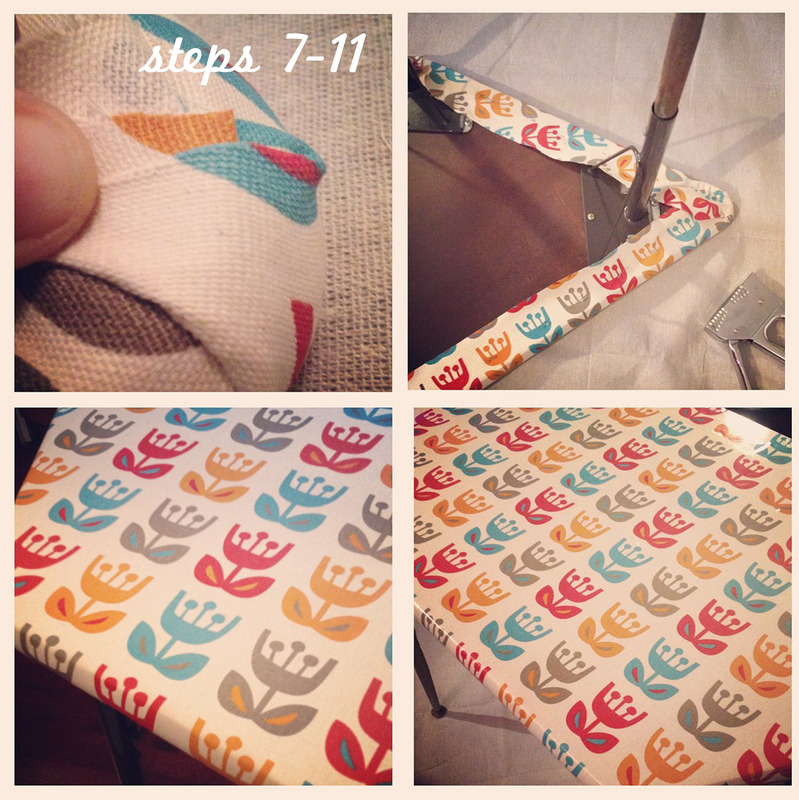 Lowly old table + cute fabric + vinyl + a little elbow grease + a couple of hours = Awesome sewing table! 1. Prep: Make sure your table is nice & clean – the underside too (you’ll be all up under there!). Iron your fabric. If your vinyl has any creases or wrinkles in it, now would be a good time to lay it out on a clean flat surface in a warm room. 2. Drape: Drape the fabric (right side up) over the tabletop allowing it to hang over the edges. 3. Trim: Using sharp scissors or sewing shears, trim the edges of the fabric so that only about 3-4 inches hang over the edge. 4. Anchor: Cut a piece of double-sided tape & peel the paper off one side. 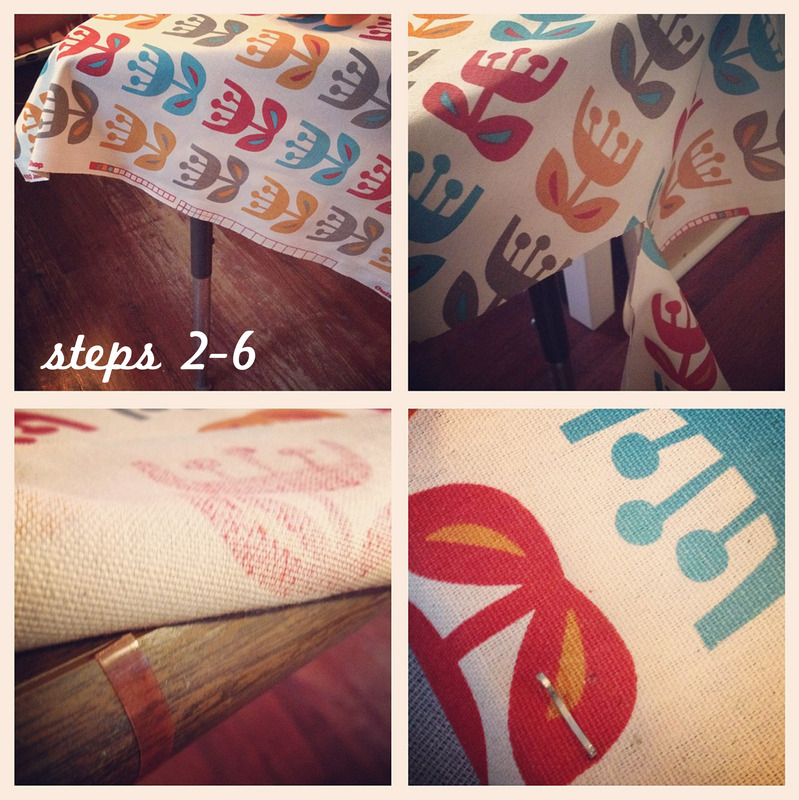 Lift a section of fabric & stick the piece of double-sided tape to the edge of the table. Remove the other piece of paper & press the fabric down, holding it for a few seconds to make sure it sticks. The goal here is simply to keep the fabric temporarily positioned in order for you to turn the table onto the floor. You can skip this step if you’re not worried about the print/pattern lining up on the finished piece. 5. Flip: Lay your drop cloth/sheet down on the floor & flip the table, top side down, on the cloth. Do this carefully so your fabric doesn’t come un-taped or shift as you flip. 6. Staple: Starting with one of the longer edges of the table (about an inch from the corner), gently but firmly pull the fabric over the edge of the table & staple it down with the staple gun about 1-1.5 inches from the table edge. You want to pull the fabric tight but not too tight or you’ll distort the print. Continue stapling along the edge, stopping about an inch before the corner. Repeat this step for the opposite edge & then the 2 other sides. 7. Corner up: Pull the fabric up at a 90 degree angle and pull firmly inward. If the corner is rounded (like mine), it will naturally make a little pleat of sorts when you pull up & in, it’s okay, just roll with it but feel free to adjust how it looks before you staple it down. Staple it a few times to anchor it securely to the table. If your corner is sharp, pull one edge in towards the center of the table & staple it down. Tuck & fold the fabric however you need to get a nice crisp corner before stapling the heck out of it. 8. Trim: Using your fabric shears/scissors, trim the edge of the fabric to even it out a bit & get rid of any floppy edges. I started using a straight edge & rotary cutter on one side & soon realized it was silly so I eyeballed the rest. It will be hidden, after all! 9. Flip: Turn your table right side up & use a lint roller to catch any stray fabric bits or dust (or pet hair) from the fabric. It will drive you nuts if you accidently trap a hair or thread forever in the next step! 10. Repeat steps 2-8 using the vinyl. You can be a little firmer with the vinyl because you want to pull it taut. Especially in step 7 – you’ll want to pull a little tighter on the vinyl so it stretches nicely over the corners. 11. Turn the table right side up & admire your work! I was oh-so-excited to get this project started, I forgot to take a “before” picture! Oops! I ran out of the right staples as I was about 3/4 of the way into the project so I finished it with staples that weren’t quite meant for the job (they had little arcs at the top for fastening cords to a surface). I smashed the extra metal flat with a hammer. I’d recommend running to your nearest home store for a refill instead of making due as I did.